Louie’s Wine Dive is a Delicious Addition on Mass Ave.
Mass Ave’s official tagline is “45 Degrees from Ordinary!”, but I’d also call it a diagonal river of booze. You can get margaritas at Bakersfield, beers at MacNivens, cocktails at The Libertine, and now, as of last month, Mass Ave rounded out its equal opportunity alcohol options with the addition of Louie’s Wine Dive. The term “dive” might be a stretch. The space is beautifully decorated with exposed brick walls, floor to ceiling shelves of wine, and large windows at the front of the place to watch all the activity of Mass Ave. When I went with a small group of friends, the restaurant was busy, but still cozy- a perfect date location, but also inclusive of some larger tables for groups. Our group was waited on promptly by a knowledgeable and attentive waitress. We learned that Louie’s is not exactly local- the wine restaurant hails from Kansas City, and the Indy location is the sixth in the nation, but I wouldn’t call it a chain. We started with the wine (obviously). There are wines for every taste and budget. For those who can’t decide, Louie’s offers flights of Malbec or Sauvignon Blanc- three small pours for $10. This was a nice option, though I wish they allowed for mix and match of wine styles, rather than three of the same types of wine. If you’re dining with the wine-averse, fear not. Louie’s offers a rotation of local brews, as well as a cocktail menu and some rather delicious sangria, both red and white. Happy hour (which varies based on the day) offers sangria for $5. 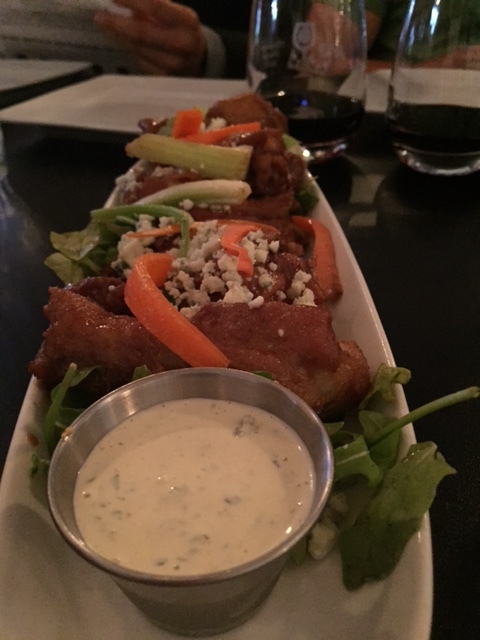 After working out the wine orders, most of us ordered the Malbec flight which littered our table with glasses and garnered some amused, if not concerned, looks from neighboring tables, we ordered the confit chicken wings as an appetizer. The menu said the wings came in a housemade Cabernet chipotle sauce, which I could have used more of, but overall these were a tasty and easily shareable starter. 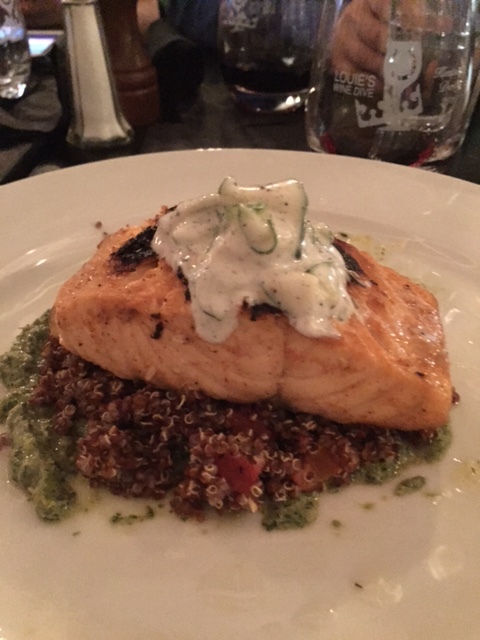 For my main course, I got the Tandoori salmon at the recommendation of our waitress, served with roasted red pepper quinoa and cucumber salad ($15). The fish was well-cooked and tasty, and I enjoyed the unique combination of flavors. Everyone at the table ordered something different. One, who ordered the bone-in pork loin chop, said it was “very tender” and appreciated the fact that it wasn’t overpriced at $17. For pasta dishes, the Shrimp Diablo ($15), a huge plate of penne in a spicy red sauce with lemon sour cream seemed to delight- according to my friend “it was spicy, but not unenjoyable.” When I asked my friend who ordered the crab cakes ($18) how his dish was, the only responses I got were the phrases “Fab Crab” and “Boss Sauce”. So I’m guessing he enjoyed his food, but there’s also a chance he was just spouting off some marketing ideas. The real winner of Louie’s though, in my opinion is dessert. They say life is short, so eat dessert first, and I’d actually say just skip dinner altogether and just order wine and the divine white chocolate bread pudding. Four people easily shared a HUGE piece of bread pudding that came out with bourbon creme anglaise. At first bite, more than a few expletives were dropped at the table. It was just SO. GOOD. Creamy, flavorful, sweet but not overwhelmingly so…just go order some…you’ll get it. Louie’s is a nice little addition to the Mass Ave dining and drinking scene. I enjoyed my night there, and I will be back to take advantage of their happy hour specials. I was also told they offer in house wine tasting classes and wine parties- if you host that party, please invite me. And if I get that invite, you better bet we’re ordering some bread pudding. Check out more Louie’s Wine Dive pictures here. This was a nice review, Molly. You seem to have a great personality – spicy, but not unbearable. Be on the lookout for an invite to my upcoming wine party at Louie’s. Hope to see you there! That part about the crab was funny.